“Come and let me show you the bus stops in Krumbach,” our guide said. Hmm… there must have been times in my life when I was less excited about an invitation, but right then I couldn’t think of any. Surely there had to be far more interesting places to visit in Austria. 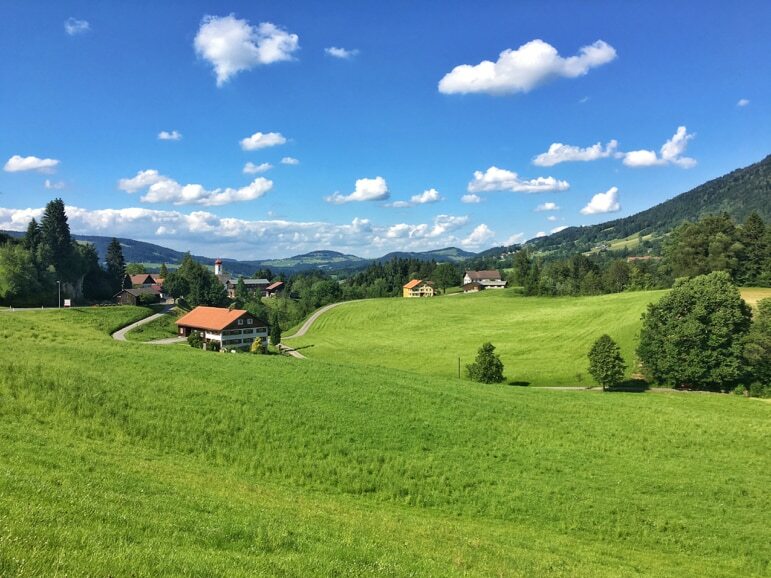 I was in Krumbach in the Bregenzerwald region of Vorarlberg, and in that moment I feared I might lose the will to live. Bus stops! What could be interesting about bus stops? Well, surprisingly, quite a lot. The next hour was to turn my assumptions upside down and reveal to me one of the quirkiest places to visit in Austria. Creativity, innovation and local pride were on display in a beautiful rural backdrop. Our guide to this unusual cultural phenomenon, Cornelia, took us from bus stop to bus stop. And it was clear that the tiny village of Krumbach, had come up with a touch of marketing genius. They have created a must see attraction from what was a very everyday experience. 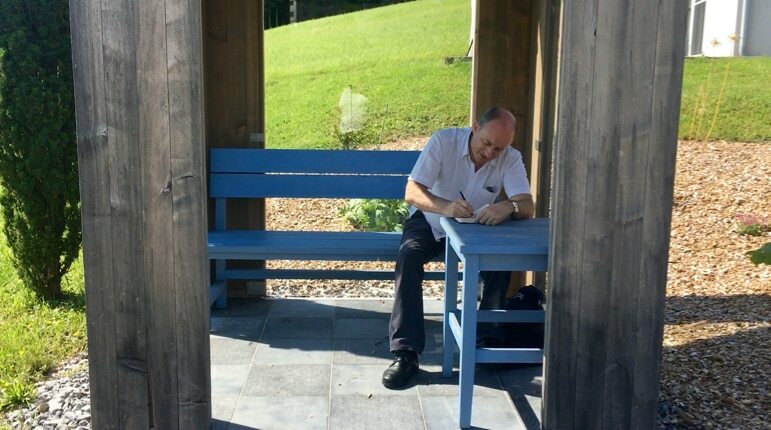 In 2013 renowned architects from around the world were invited to design seven new bus stops in Krumbach. Architects from Japan, Chile, Russia, China, Norway, Spain and Belgium were involved and they partnered with local firms to construct them. 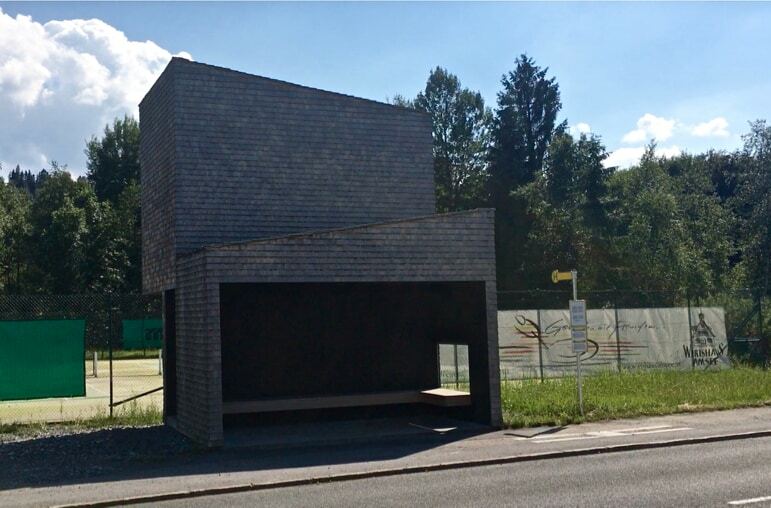 Since 2014 these seven highly unusual bus stops have altered the landscape of Krumbach. Each bus stop is unique in its design, function and form, but all share an expression of the architect’s inspiration and imagination. 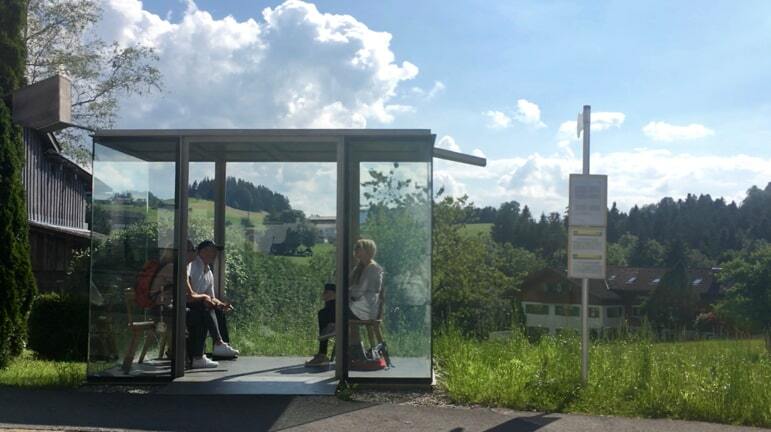 Here’s my quick tour of the Krumbach bus stops. 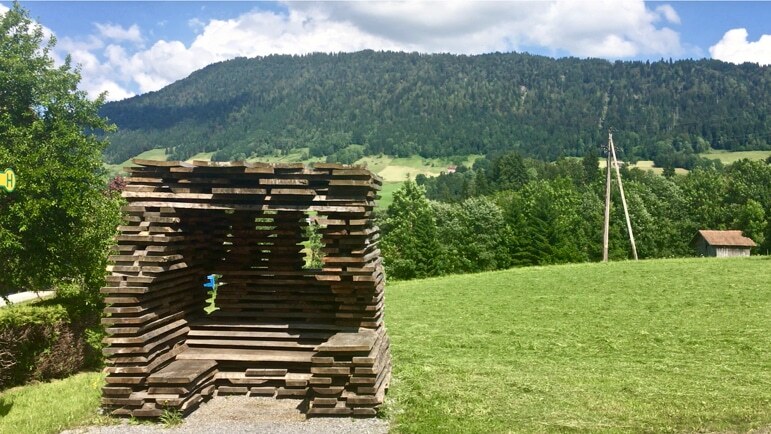 Half bus stop, half shelter it is an unusual structure formed of planks of untreated oak stacked layer on layer. It gives limited protection from the weather, but being surrounded by all that wood and with views of green rolling pastures, it has a surprisingly relaxed feel. A rather bizarre triangular type construction, but what the hell – it is artistic. It has no windows, but its open aspect allows users to see when the bus is coming. A simple glass structure with a few wooden chairs and a bird house attached to the roof. While it is simple it is also striking as it is set against a broad open landscape. An intriguing design in as much that it has a small window which gives glorious views over to the mountains, while the wooden sides are open to the elements. Beautiful but perhaps not practical on a wet windy day. This stop may not be the most attractive from the road, but it has a dual function. Besides its transport duties it also serves a viewing platform for the tennis court which sits behind it. Is effectively a wooden tower. On the ground level it is enclosed on three sides by glass, and has a table and bench to sit at. And above it you’ll also find a bird house. Perhaps the strangest place to hop-on hop-off in Vorarlberg. 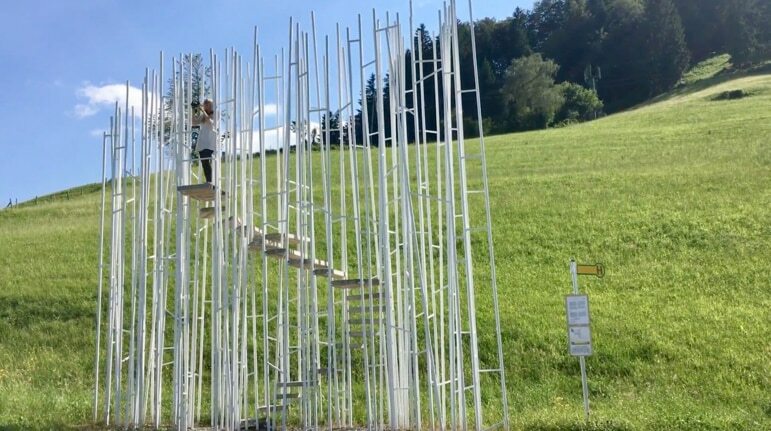 This bus stop consists of collection of metal rods with open stairs which you can climb to become part of the art. 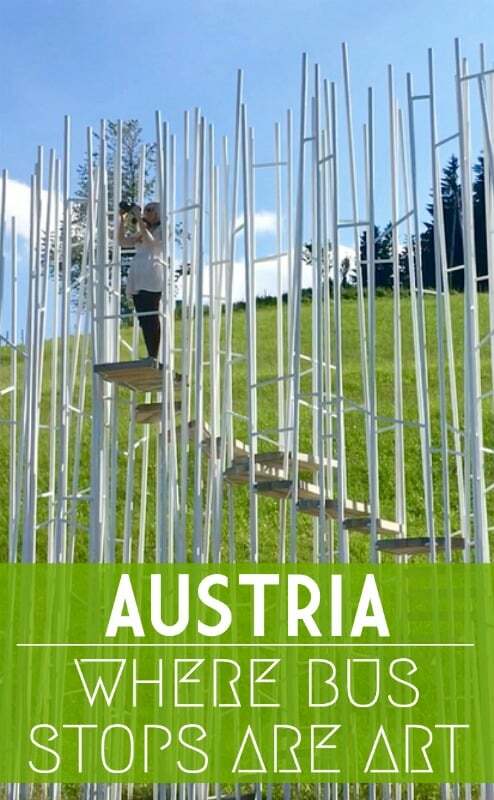 It’s definitely one of the quirkiest places to visit in Austria that we’ve found but it is nevertheless a fascinating concept. Each bus stop has its own unusual traits and details, some more traditionally practical than others. 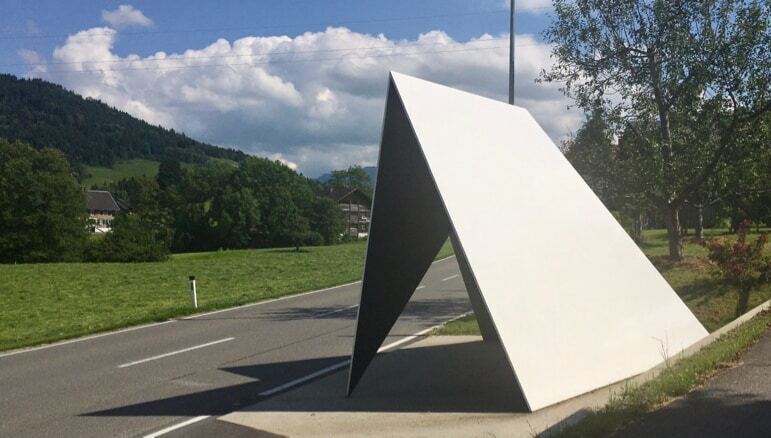 However they all make a statement and create an innovative piece of art, as well as serving Krumbach’s 1,000 locals. I started out fearing the bus stops would be boring, and I finished completely engrossed in fabulous innovation and ingenious creativity. I also was full of admiration for a small village in rural Austria, which took a simple commonplace aspect to life and turned it into a renowned attraction. 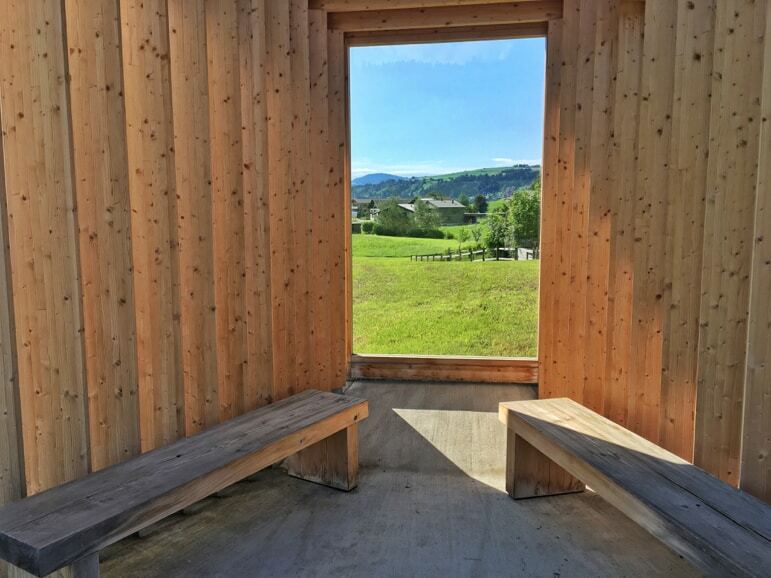 The bus stops of Krumbach are a great example of contemporary architecture and a testament to human ingenuity – don’t miss them.